Since I’m the kind of person who likes to measure things “because I can”, it seemed sensible to include Heat Meters on the outputs from the NIBE F1145 Ground Source Heat Pump and also to include an Electrical Sub-Meter on the input. Doing this makes it possible to compare the output power with the input power and calculate the real-world Coefficient of Performance (CoP) of the Heat Pump – a bit like recording all the fuel you put in your car so you can calculate its actual MPG. The Heat Meters are Kamstrup Multical 302 units with wired M-Bus interfaces which are automatically read every 2 minutes as described in this Technical Article page. Data is published via MQTT and loaded into an InfluxDB database where it can easily be plotted using Grafana. Two separate Heat Meters are required because there are two separate output pipes from the GSHP – one for the Central Heating and one for the Hot Water. (Within the GSHP unit there’s only a single heat source but there’s a diverter valve that sends water to the appropriate output pipe; the return pipe connection is shared.) While the downside is the cost of the extra heat meter, it does make it easy to see when the heat pump is in ‘heating’ mode versus ‘hot water’ mode – which is important. Read on for further detail on how these numbers were derived. Note that at this time of year the ground is still relatively warm and the ‘brine’ coming in from the ground loop is around 10 degrees, returning at around 5 degrees. In ‘heating’ mode, the heat pump is configured to deliver water just hot enough to compensate for the heat loss from the house at a given outside temperature. For example, at 4 degrees outside it calculates it wants water at 31 degrees but since the F1145 does not have such a low setting it actually generates water at about 37 degrees. (However it measures how much it is over-delivering by keeping track of the ‘degree minutes’ of the water it produces and won’t turn on again until the average delivery matches its calculated target.) Producing water at 37 degrees, the heat meter records a power output of almost exactly 10 kW while consuming almost exactly 2 kW, giving a CoP of almost exactly 5. Note that this is an ‘instantaneous’ figure and doesn’t take account of the ongoing low consumption of the GSHP when the compressor isn’t running (consistently showing as 60 W even with the circulation pump running at 30%). Note too that as the weather gets colder outside the water temperature required will increase and the CoP will tend to reduce. In ‘hot water’ mode, the heat pump is configured to bring the stored hot water up to 50 degrees (except when running the special anti-legionella sterilization cycle where it goes to 60 degrees instead). To do this, it produces water at up to 55 degrees and when doing so the heat meter records a power output of 8.8 kW while consuming up to 2.85 kW – i.e. with a CoP of 3.09. The ‘up to’ is because the heat pump ramps up its output temperature as the hot water tank heats up, so when the tank is only at 40 degrees the heat pump only bothers delivering water at 45 degrees where it has a much better CoP of around 4.5. Overall, the conclusion is that the NIBE F1145 is performing in accordance with its (excellent) published performance figures and has been installed and commissioned well (kudos to Carbon Legacy for that). It’s significantly beating mains gas on both cost and CO2 emissions grounds. As the winter has progressed and the ground temperature has reduced the efficiency figures are less impressive than they originally were. See here for a revised set of figures from February rather than November. It’s only reasonable to expect the generation from solar panels to be less impressive in winter than in summer but today was a good illustration that some days in winter can still deliver good results. The almost complete absence of cloud today meant some level of generation right from sunrise (07:44) to sunset (16:00) and peak generation of 3.143 kW around noon (from a nominal 5.4 kWp installation). The daily total of 17.52 kWh is half that of the best days in May (the best month so far) but much better than the worst days in May. The graph from the SolarEdge dashboard is a very pleasing shape, without the usual ups and downs as clouds pass over. 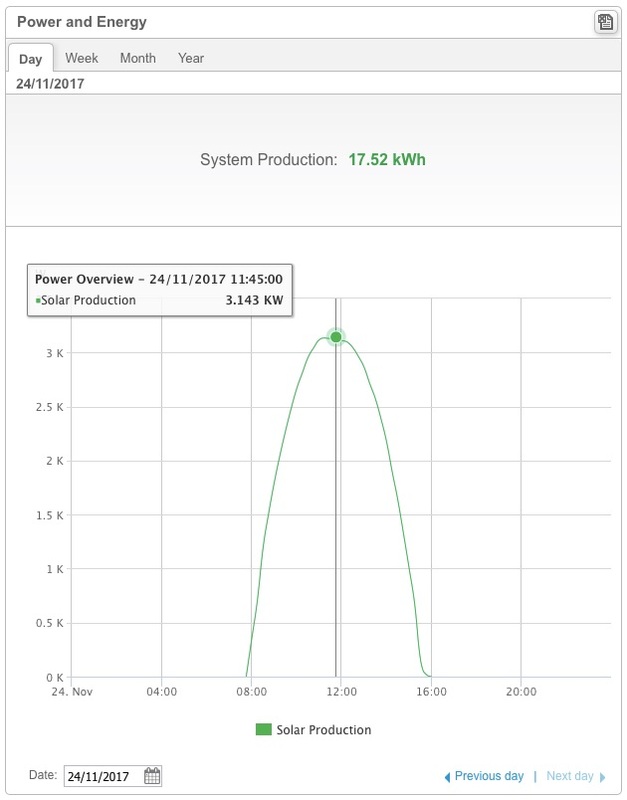 The generation was more than sufficient to re-heat the hot water via the immerSUN automatic solar PV diverter (as still happens most days) and managed to supply the 2 kW required for the ground source heat pump when it ran for 20 minutes to heat the house around noon. At other times it was exporting to the grid, managing 6.8 kW of export in total. Overall: not a bad result for a month before the shortest day of the year.